This pic was taken on my first day of high school, 1995. So I was 12, my sister Amy (standing next to me, I'm the tallest one on the left) was 10, Katie-Ellen (standing in front of me) was 4 and Ellise (next to her) was 6. How cute are my little sisters! Oh how I love them so much. The only one missing is my little brother Nicholas, who would have been 2 at the time. I've been searching for one of my fav pics of him when he was little on facebook but can't seem to find it, but when I'll do I'll post it coz it's just so cute. It was taken on his 4th birthday and he is dressed as Woody from Toy Story. Too cute for words! And here we are, 14 years later, (almost) all grown up! 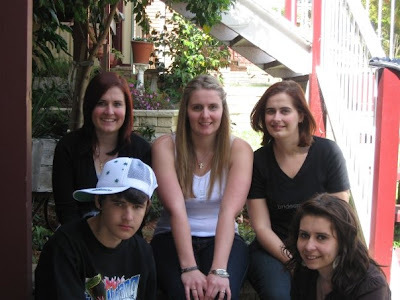 Current Ages - (from back left) Katie, 19 (on the 26th Sept), Amy, 25, me, 27, Nick, 17 and Ellie is 21. How beautiful are my sisters! They've gone from cute to even cuter! And my bro is so bloody tall now! Over 6 foot and he loves to rub it in! I love having so many siblings. Though we may have driven each other nuts when we were younger (and they still drive each other nuts from time to time, all living together at Mum's!) but I would never give them up for the world! 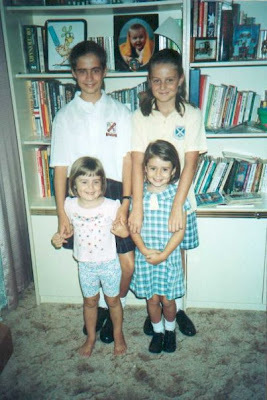 I feel so sorry for anyone who's not as lucky as I am to have such wonderful sisters and brother! You are lucky to have lots of siblings. I have 2 older brothers and an older half sister. I didn't grow up with my sister and always longed to be close to her and have a real sister. thanks Mrs P. Love from soon to be Mrs H.
No problem future-Mrs. H...Love ya Sis!